If you dread road trips, errands, or play date drop-offs because your car has long ago lost its new-car smell, you need to get moving and get organized. Here are some of my favorite automobile makeover tips. Everything you bring into the car needs to leave with you at the end of the drive. This includes sweaters, wallets, or receipts acquired along the way. You clearly can’t return the latte you bought at Starbucks, so why save the receipt? Look around before you head into the house, and never go in empty-handed. Keep a supply of garbage bags in the car for wrappers, packaging, or paper that may appear during the daily carpool route. Always empty it when you reach your destination. Keep a package of wipes in the car for faces, hands, and occasionally, the car upholstery. There likely won’t be a day when you don’t use them. You may need a few toys to entertain younger children on longer rides. Consider purchasing a car organizer that hangs from the back of the passenger and/or driver’s seat like the Munchkin Backseat Organizer ($11.99 at Diapers.com). Stock your glove compartment with the following items: car manual, registration and insurance, mobile phone charger, a small change purse with quarters for meters, hand-wipes, a travel tissue pack, and a couple of food-replacement bars or other shelf-stable snack. Wash your car at least once every few months. And when the crumbs pile up, do a little vacuuming in between the seats. Spray a little scented car freshener and before long, you’ll be itching to take a road trip. Mothers are the queens of the castle and usually the organizers-in-chief. 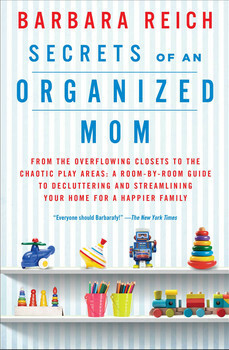 Secrets of an Organized Mom is a trusted resource not to be dismissed as organizing guru Barbara Reich offers a life-changing program for your life and home. Mothers can feel like life is running on a never-ending loop. Just when one problem or responsibility is overcome, another trips us up. But help is on the way: Barbara Reich has all the strategies for staying ahead of the curve—and she’s wrapped them up into four easy steps that can be applied to any organizing project: 1. purge, 2. design, 3. organize, and 4. maintain.